The BIZARRE COLLECTORS' SPECIAL was a one-shot companion to Marvel's PLAYBACK and also intended to spawn a regular monthly magazine. Bizarre covers those obscure and crazy schlock movies so favoured by fanzines. Whether this was ever likely to generate a large enough readership to sustain an ongoing title (even by Marvel UK's more modest standards) is questionable but - based on this try-out - it would have made for fascinating reading. 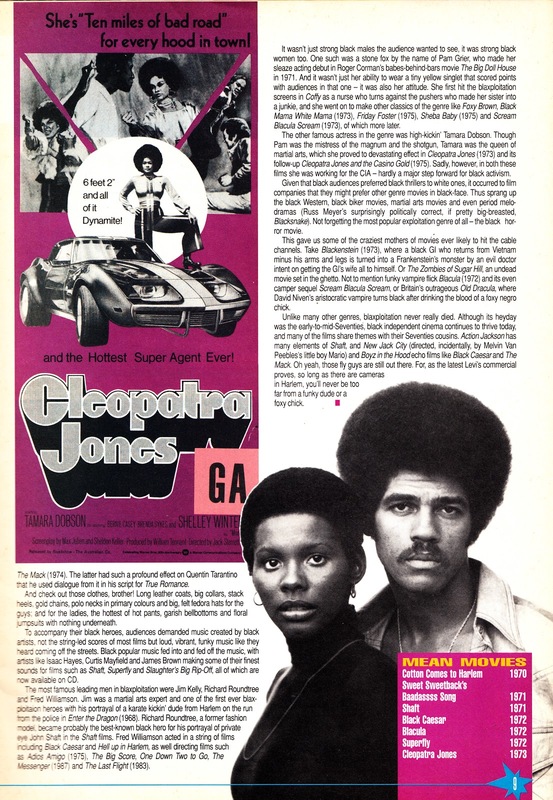 The special follows an A-Z format and - by way of a sampler - I've included the two-page "B" article, dealing with Blaxploitation flicks. As with Playback (as well as HAMMER HORROR and the DWM spin-offs), Bizarre coincided with a change of management - and direction - at Marvel UK which saw the company (largely) retreat from the teens and older category (DWM being the single exception, and today's management must be so grateful that M-UK didn't surrender the license to what appeared to be a dead show) in favour of licensed kids characters. Plans for the monthly were abandoned and Marvel Magazines all but disbanded. Don't be confused the later magazine of the same name. There's no relation.